In the state of Manipur, there are numerous indigenous tribes that are residing here since ages. The tribes of Manipur are known for their beautiful culture, distinctive lifestyles, and various religious faiths and festivals. Of all the tribes in Manipur, Kabui Nagas is one of the most eminent tribal community in Manipur. Gang Ngai Festival is one of their important festival which is celebrated with much love and ardour. The festival of Gang-Ngai is a synonym of dance, fest, music and spiritual rituals. 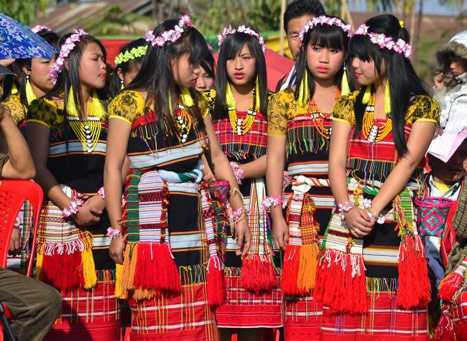 The term Gang Ngai stands for the festival of winter and is also touted as Chakan Gaan-Ngai. Celebrated for a straight five days, this exuberant festival in Manipur is observed in various parts of the state. Basically, these five days of the festival remain full of fun and cultural extravaganza. On the first day, the locals performed various sacred rituals to pay reverence to their ancestors. The rituals include sacred fire, homage and prayers to the deities for the good health of the community. The graves of the ancestors are also embellished with flowers. Followed by this, the next four days observed the continuous festivities with dance, music and community feast. During this time, the men and women of Kabui Nagas community, wearing their traditional attire, dancing on the streets on the melodious tunes of traditional musical instruments played by the men. Not just this, gifts are also exchanged amongst the family and friends. However, recently, various sports activities like long jump and shot put, have also been included in the celebration of the festival. On a whole, the festival of Gang Ngai signifies the spirit of communal unity, peace, love, and prosperity. The Gang Ngai festival is celebrated in the month of December/January. It is observed for a whole long period of five days. Gang Ngai festival is celebrated to pay homage to the ancestors of the people of Kabui Nagas community. Various dance and music performances are performed by the locals. A communal feast is also organized during the festival. Men and women of the community put on their traditional attire to perform the dance and musical performances. A number of sports activities are also organized during the course of this festival.